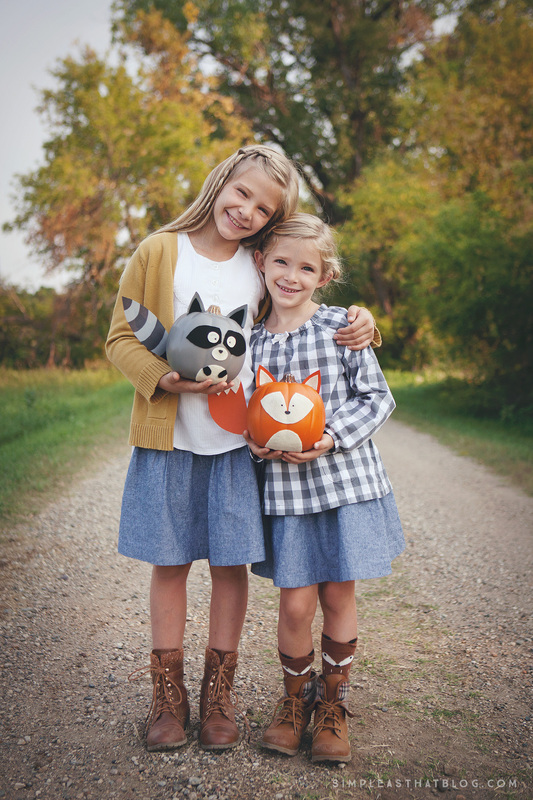 These Woodland Creature No-Carve Pumpkins are the perfect way to dress up your pumpkins this fall. 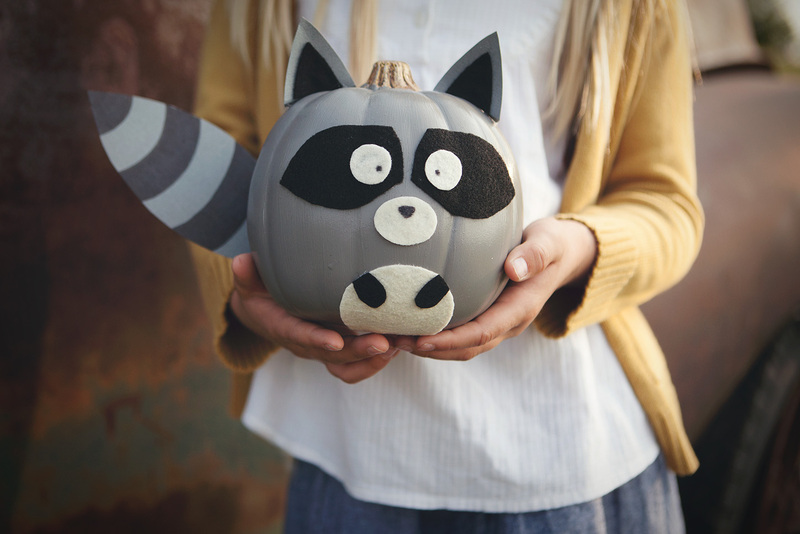 If you love pumpkins, but loathe carving them, this is the project for you! Hooray for September 1st! I am so excited for fall this year. I think it has to do with the fact that we just moved to North Dakota and we’ve heard the fall colors here are beautiful. 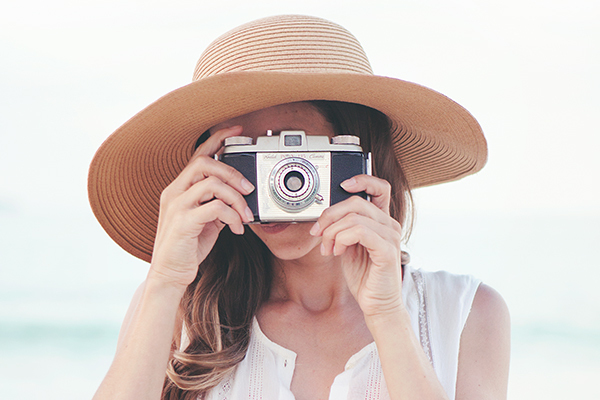 We’ve been living in Arizona the past three years and we’re so excited to experience four seasons again! 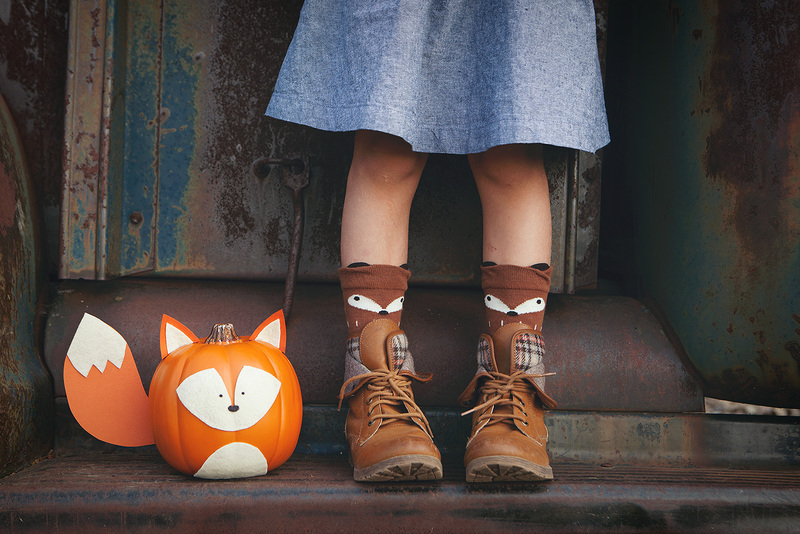 Find the darling fox socks here. We love ours! 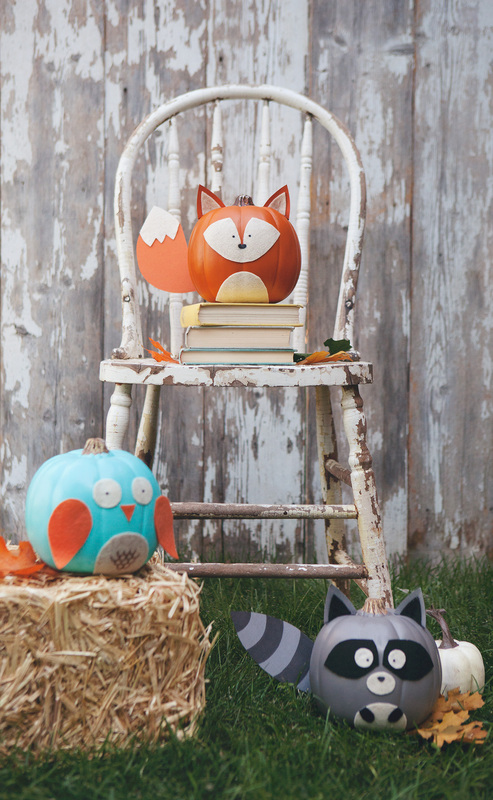 We can’t wait to start decorating our new home for fall and we’re going start with these cute Woodland Creature Pumpkins! 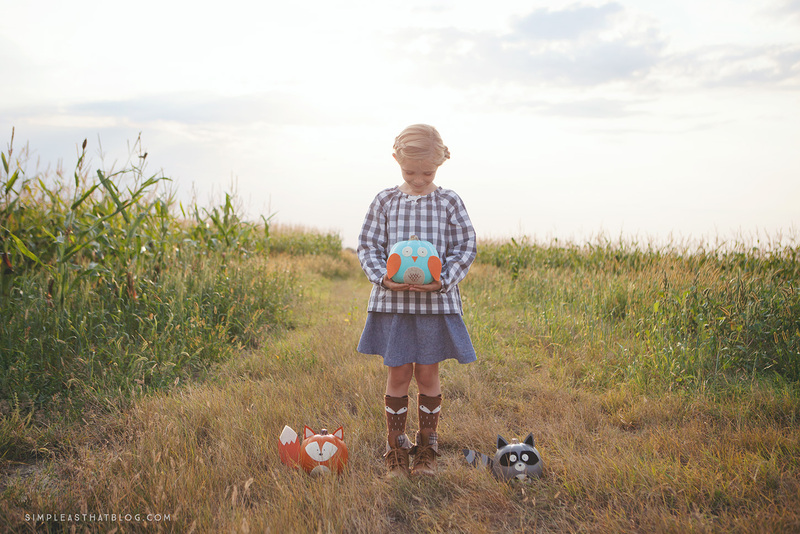 The inspiration for these pumpkins came from these Woodland Creature Cups we made last year. We loved them so much we thought we’d try our hand at making them again, only this time using pumpkins! 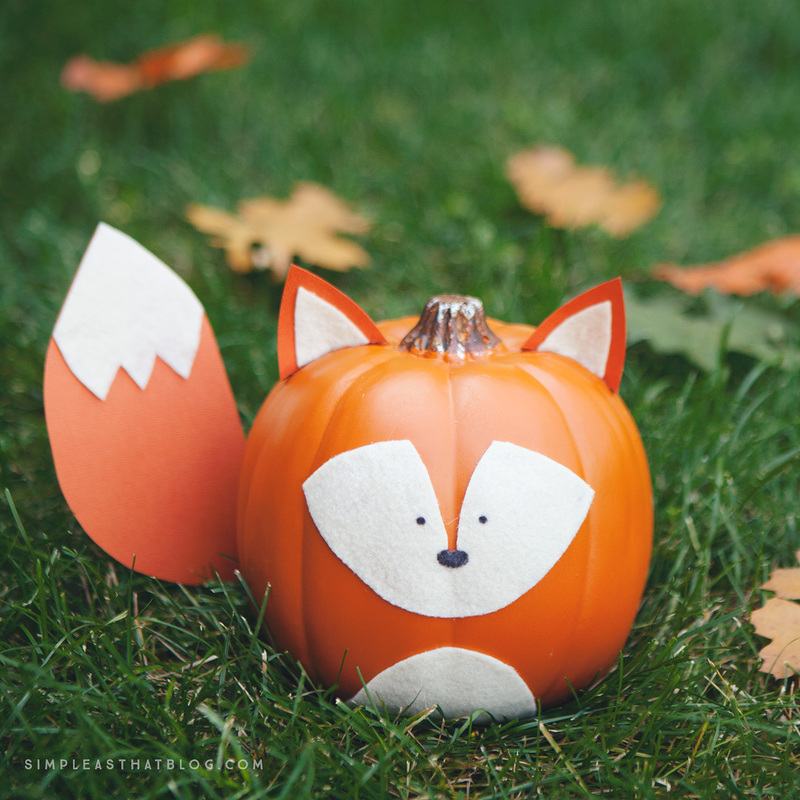 These darling little pumpkins are a great craft to get the kids involved with and the best part is, because they’re made using faux pumpkins, they can be enjoyed again year after year! 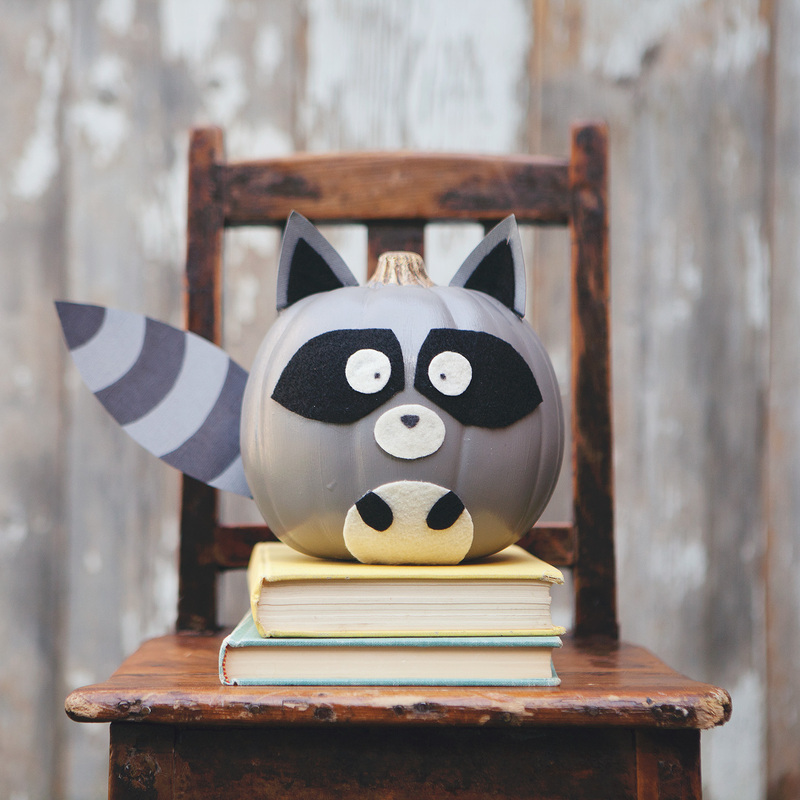 I’ve tried to make it as easy as possible for you to recreate these pumpkins at home. Simply print out and use the templates provided (links included below) to cut out all the felt and paper pieces you’ll need. 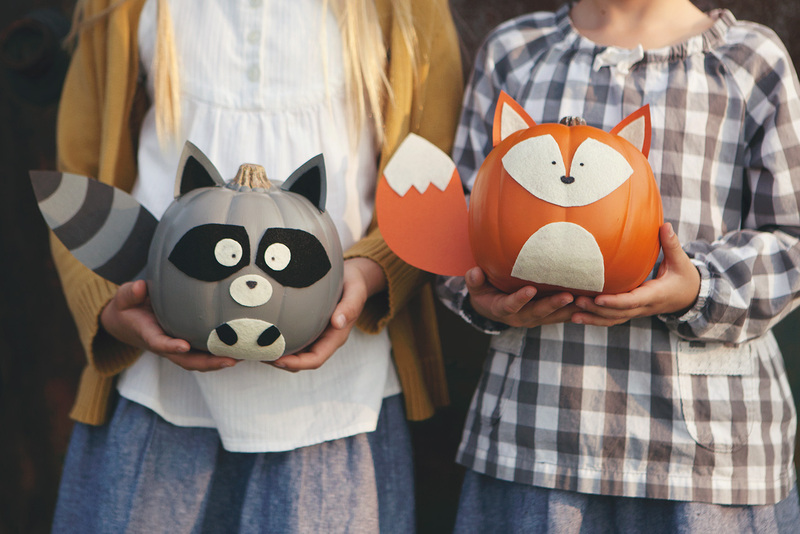 The templates are for the woodland creature craft cups so depending on what size of pumpkin you’re using you can use the “scale” feature within your printer options to increase or decrease the size of the printed templates. For these pumpkins I printed at 125 percent. Gather supplies. Orange faux pumpkin, orange cardstock, sharpie, off-white felt, scissors, adhesive. Remember to enlarge if using a bigger pumpkin. Print and cut out pattern pieces. 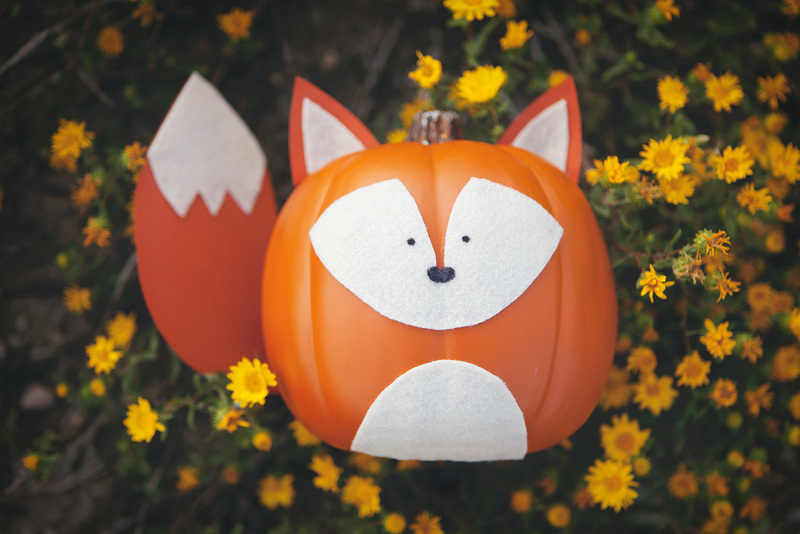 Use pattern pieces to cut out felt and orange card stock for the fox’s tail, ears and face. 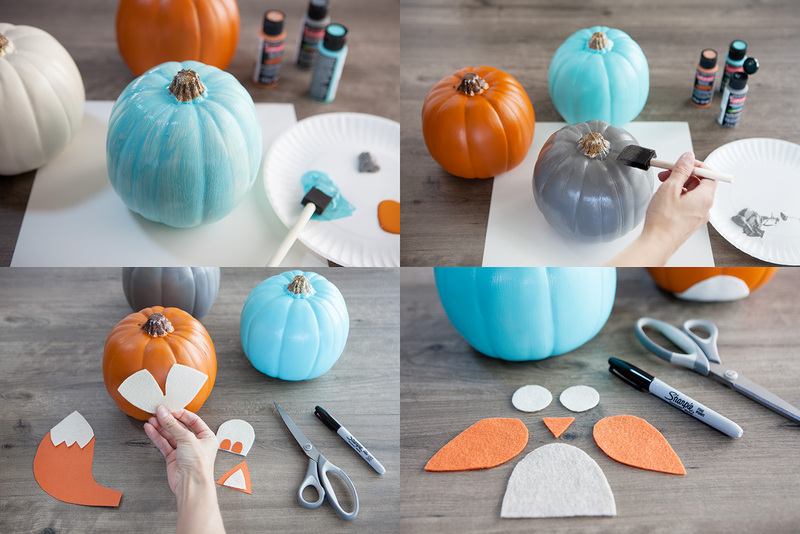 Attach paper pieces to pumpkin as shown using adhesive / glue gun. With a sharpie add a nose and eyes. Gather supplies. White paper cup, grey, black and white cardstock, sharpie, scissors, adhesive, grey craft paint and foam brush. Paint white pumpkin with grey craft paint. Allow to dry completely. Print and cut out pattern pieces. Use pattern pieces to cut out black felt and grey card stock for the raccoon’s tail, ears and face. Using a sharpie color black stripes on Raccoon’s tail. Begin attaching paper and felt pieces to pumpkin as shown. Gather supplies. 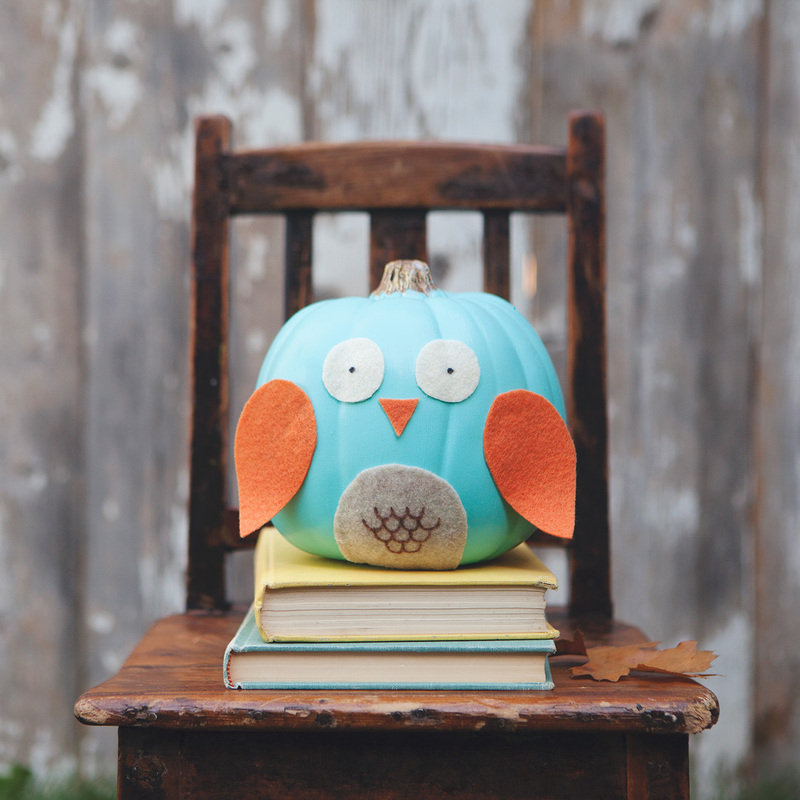 Ooff-white pumpkin, turquoise craft paint, tan, off-white and orange felt, sharpie, scissors, adhesive. Paint white pumpkin with turquoise craft paint. Allow to dry completely. Print and cut felt out using pattern pieces. 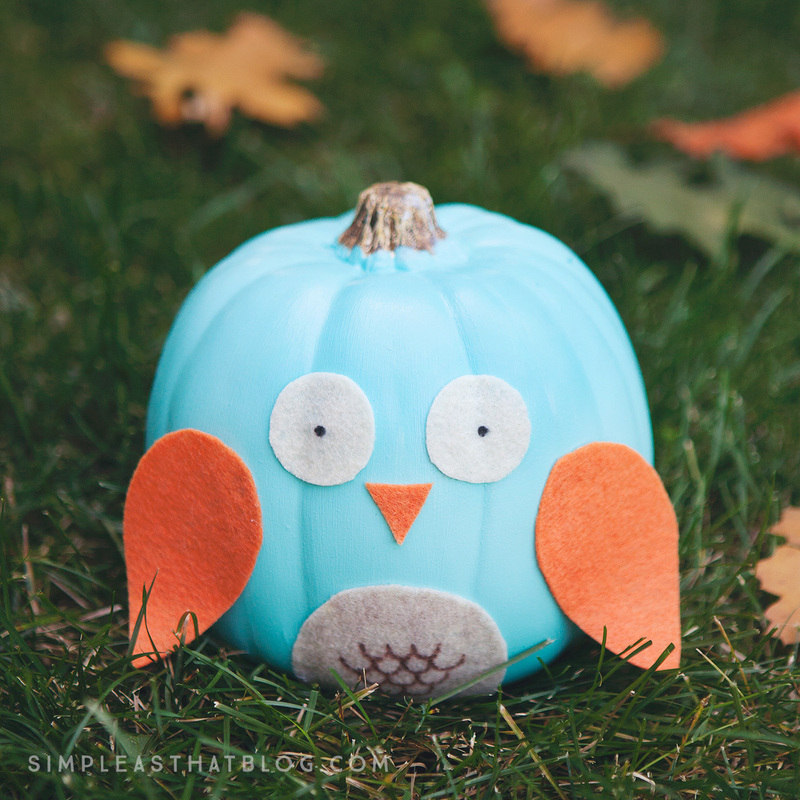 Attach felt pieces to pumpkin as shown using adhesive. With a sharpie add a eyes and some feathers. I love these Rebecca! So cute! These pumpkins are absolutely adorable. I love them! 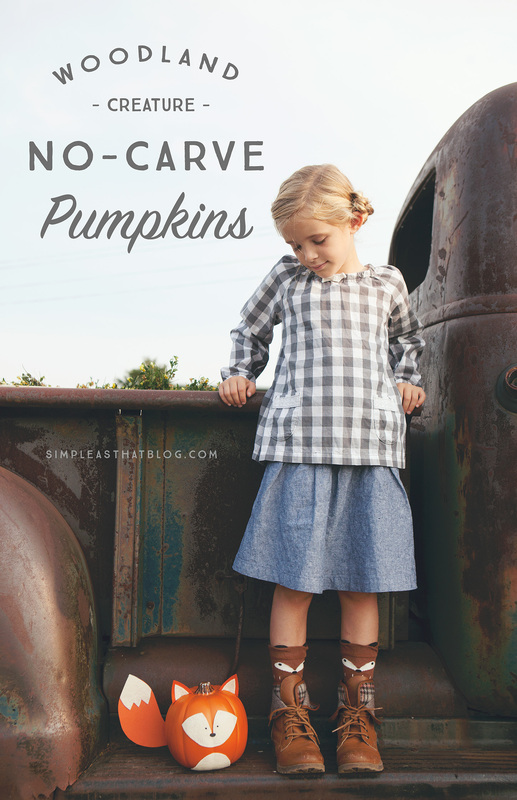 I love this no carve pumpkin idea! When I was younger it was always frustrating when the pumpkin I was carving didn’t turn out exactly like the template. This is a safe alternative to using a knife. Awesome post! 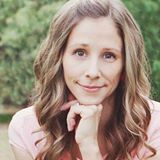 Sharing with my friends and family with kids! Absolutely adorable! So cute! 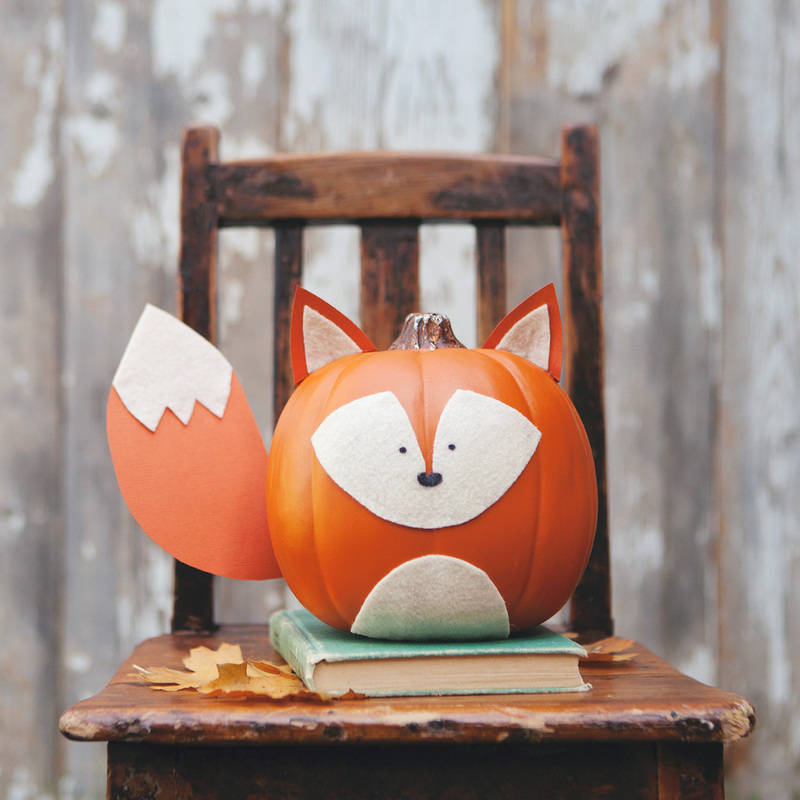 What are the faux pumpkins made of, and where did you buy them? Super fun craft. Did it today with my girls. Added a bear because one of my girls is obsessed. Thanks for the idea. Also found the pumpkins at Michaels-60%off! Loved this idea so much that I wrote a post about fancy pumpkins and featured your pumpkin at http://penandpaperdesigns.com/2016/09/26/five-ways-to-make-your-pumpkins-beautiful/ Please let me know if you have any reservations about me featuring your pumpkin-making skills (I did include one image in my post). Thank you for making such awesome pumpkins! Hello, what type of adhesive did you use to glue the felt and card stock to the pumpkins? I used a glue gun. Oh my goodness! Ok, you win. 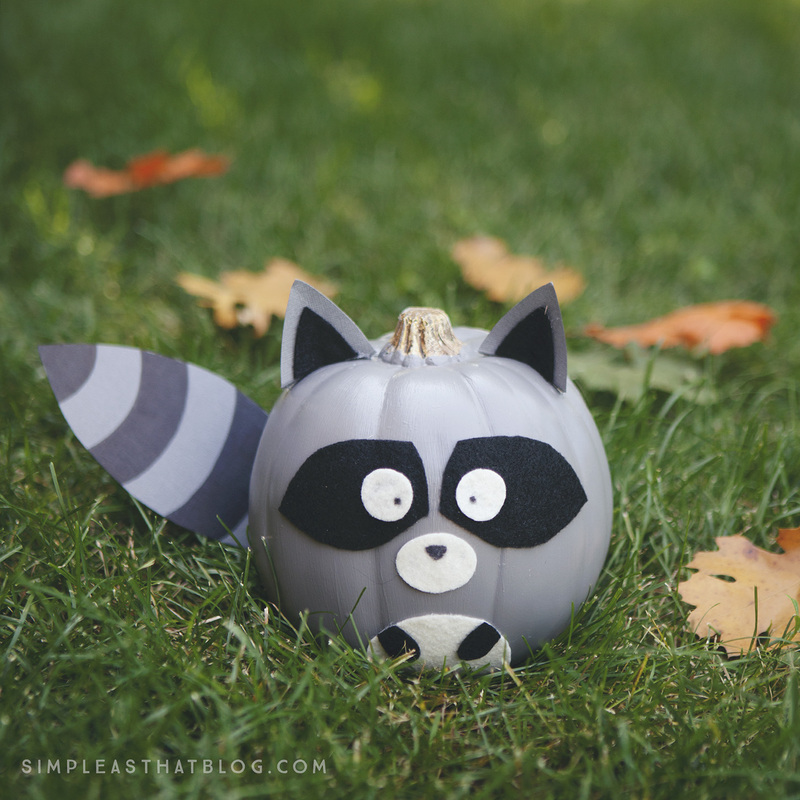 This is the cutest Halloween craft I’ve seen this year. I’m swooning! What is the approximate size of these pumpkins? Also, I love their skirts. Could you tell me where to purchase them? Where did you get those adorable fold-down brown boots? They are so cute!! Can you let me know the approx size of these pumpkins? Trying to decide how big to make the template on my printer! Thank you! I’d say they’re medium size. At Michaels there were pumpkins smaller and larger than this one. Hope that helps. 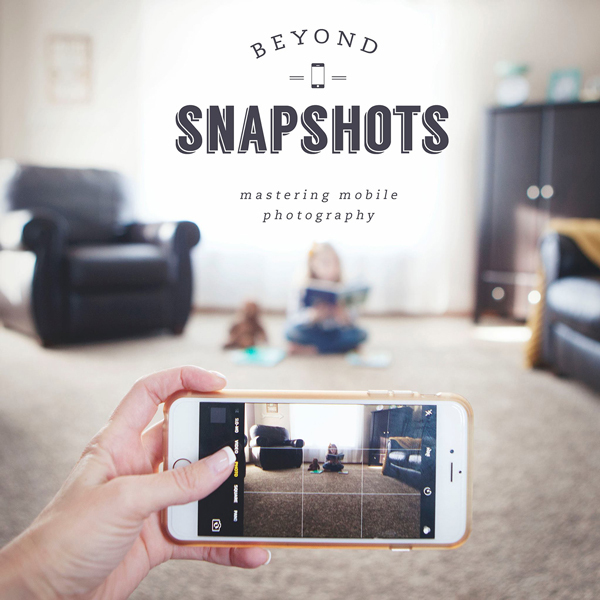 I tried the links for the templates, but the pages are no longer available. 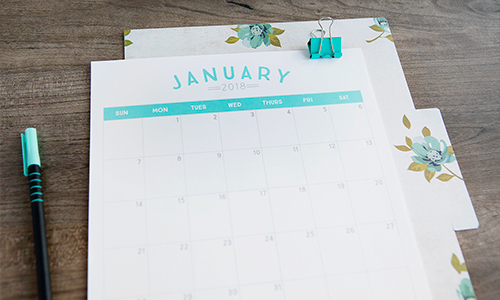 Any ideas to help me get these three templates? We are having a woodland baby shower for my daughter and I would like to make these. Thanks in advance! I would love to get the patterns for these but the links have expired. Can you help me get this patterns? These are adorable. I too am looking for the templates but the link is not working. Any idea how I can get the patterns?